Ordering food has never been easier – we at MobiLab moved it to a whole new level. By using the Vapiano app with just a couple of steps, you can now get your favourite meal delivered directly to your table. 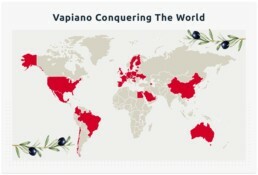 What makes Vapiano one of the most successful restaurants, with more than 200 Vapianos in more than 33 countries? One would say delicious food, the other would say charming Mediterranean hospitality, beautiful interior design, or even innovation. All of this is true, as it all represents a perfect combination of the ingredients for the best recipe. But to make a world-class meal, it is important to have a master chef who is always striving for perfection. As the world has gone mobile, so did Vapiano. If you haven’t installed the Vapiano mobile app already, you should check it out for iOS and Android. As every successful software masterpiece goes through multiple evolution phases, so did the Vapiano app. From the first version which covered basic features, such as finding restaurants on a map, checking the menu, and special offers, it evolved into a complete ordering system with user-friendly and neat features. A recently introduced feature can easily be considered as one of the biggest tech improvements that Vapiano (together with MobiLab) offered their users in the last decade. Imagine sitting in a Vapiano restaurant, opening the app, finding your favorite meal, ordering it, and getting it delivered to your table. How is this even possible? Well, it is! Especially with the new Mobile Ordering Food feature! This awesome option is now available in a couple of restaurants in Berlin, but it is being rolled out to cover all restaurants worldwide. 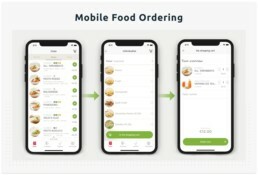 A phased roll-out is used, as the infrastructure of every restaurant has to be reorganized and adjusted to support the mobile food ordering feature. Once you check into a restaurant, you are able to search all categories and dishes available, along with their prices. If you select a drink or dolci, it will be directly added to your basket. If you select a meal, the app will show you the Individualization screen, where you can choose between different types of the meal, as well as add extra ingredients. After this step is completed, the meal will be added to the basket. Once you get to the basket screen, you are almost done. Here, you can review your choice and make some final adjustments. After you hit Order now, your order will be directly submitted to the Vapiano kitchen. In a couple of minutes, once the meal is ready, it will be delivered straight to your table. Bon appetit! The first restaurant that implemented the Mobile Ordering Food feature is in Berlin. Soon it will be rolled out in Cologne, in the restaurant next to the Schokoladenmuseum, so feel free to check it out. If you are up for drinking a few beers and talking about technology, visit our MobiLab office across the street along the way! Mirza Zenunovic is an iOS developer at MobiLab. He is working as a Technical Product Owner on the Vapiano app.